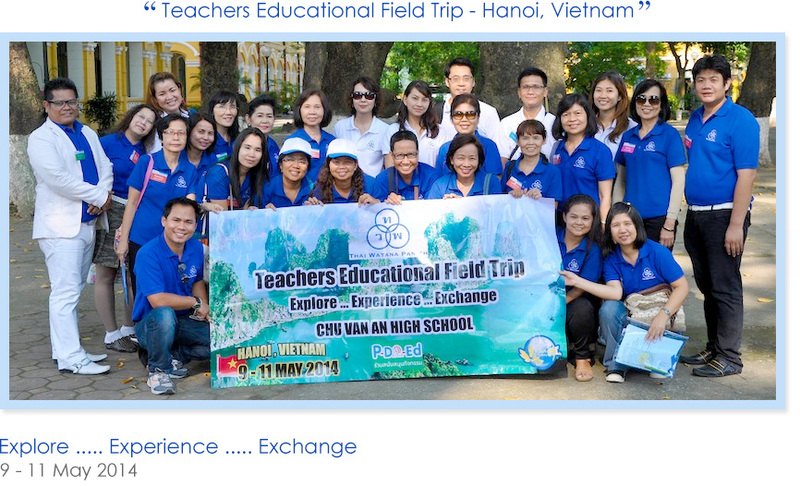 Our second teachers educational field trip was to Hanoi, Vietnam during 9th to 11th May 2014. It was an honor for TWP management and a group of twenty one English language teaching Thai teachers to have an opportunity to visit Chu Van An High School, one of the top three national high schools in Vietnam and the best national high school in Hanoi. The school was established by French authorities in 1908 as High School of the Protectorate, and it is one of the oldest institutions for secondary education in Indochina. Chu Van An High School produces many scholars and top quality students of Vietnam. Our teachers have experienced live classroom teaching environment along with observing different teaching techniques Vietnamese teachers use in the school to promote top quality students of the country. Teachers also had a chance to share their teaching experiences in different culture. We have also visited Halong Bay – UNESCO world heritage, local historic attraction places, tasted local authentic food, and witnessed cultural performances.